Set fixare distributie Alfa Romeo, Fiat, Lancia, ZL-7230 - ZIMBER. 5-cylinder engine Fiat Panda, Punto, Palio, Siena, Bravo, Brava, Stilo, Marea, Multipla, Barchetta, Lancia Dedra, Delta, Kappa and Lydra. Engine Timing Kit Tool for Alfa Romeo Fiat Lancia. Fully comprehensive professional kit • Anodized Colour coded parts for easy identification • All parts of highest quality • Supplied in very handy blow moulded carry case • All parts protected by High density foam. This is the ultimate master Engine Timing Tool Kit for Alfa Fiat Lancia. Comprehensive engine timing tool set for Italian cars. Includes all tools required for camshaft alignment, tensioning and crankshaft alignment to cover a wide range of petrol and diesel engines packed in blow moulded case with bespoke foam insert with perfect indents for every tool in the collection. 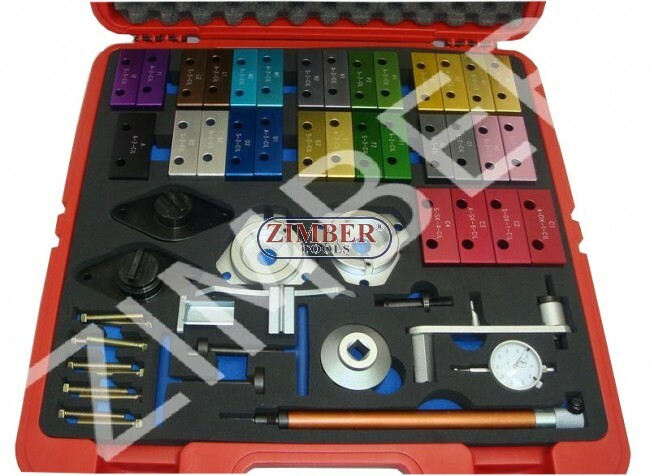 Set Fixare Distributie Fiat 1.8 16V , 1.9 TD/JTD , 2.4 JTD - ZR-36ETTS189 - ZIMBER TOOLS. Blocaj ax cu came motoare pentru Alfa Romeo TWIN SPARK 1.6/1.4 TS - 16V 2 buc- ZT-05149-I - SMANN TOOLS. Set fixare distributie Fiat, Alfa Romeo, Vauxhall / Opel 1.4 16V, 1.6 16V 1.8 16V, ZT-04A2119 - SMANN TOOLS. Set Fixare Distributie Fiat 1.4 12V//Lancia 1.4 12V, ZT-04A2241D - SMANN TOOLS. Trusa de Fixare Distributie FIAT, Alfa Romeo Diesel Motoare 1.9, 8V/16V 2.4 JTD 10V/20V- ZT-04A2206D-SMANN TOOLS. Set cale distributie pentru motoare Fiat 1.3 JTD Multi-Jet, Opel 1.3 CDTi, Ford 1.3 TDCi si Suzuki 1.3 CDTi - ZR-36ETTS172 - ZIMBER TOOLS. 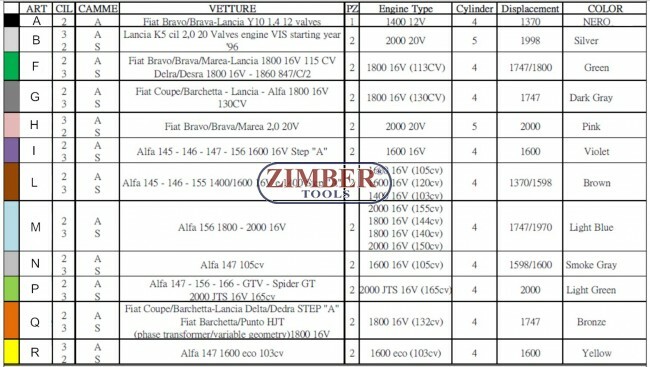 Trusa de Fixare Distributie FIAT,LANCIA, OPEL,SUZUKI, HYUNDAI,MITSUBISHI 1,3 JTD Diesel - ZT-04A2231 - SMANN TOOLS.